This condo complex at the beach in Oceanside California is a garden paradise. There are streams, koi ponds, and waterfalls providing a perfect vacation holiday in a secure condo complex covering 12 acres on the beach with subterranean parking and laundry facilities, heated pools, jacuzzis, exercise room, sauna, gas barbecues and billiards. For a fulfilling beach vacation experience we only offer vacation condos with close beach and ocean views. Walk to the Oceanside harbor village, the marina, and the Oceanside pier and restaurants. View activities your family may enjoy. 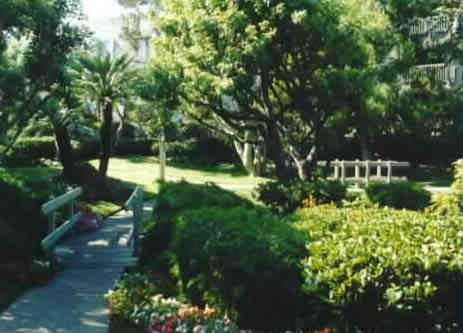 The main grounds at this beach front condo complex are landscaped as shown; this photo is taken on the grounds somewhat east of the accommodations we offer in the interior of the grounds. This allows for strolling the lush green interior area but with your particular condo lying on the beach perimeter you'll have a much different experience actually seeing the beach and ocean close up and having water features and landscaping also down below your location.The two bedroom outside corner beach and ocean view condo as well as the one bedroom option will remind you you're staying at the beach with those views. Enjoy strolling the grounds or walking out a gate and being right on the beach. Thank for your visiting...Frank and Sheila, in area vacation rental owners, North Coast Village, Oceanside California. © April 1999-2017, all rights reserved, Franks Beach Condos, beach rental, no permission to copy for commercial purpose.